With the right blueberry wine recipe, and a little creativity, you can make some delightful and very tasty wines. 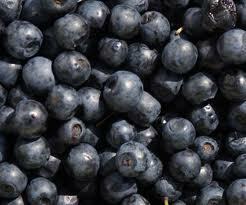 The color, rich flavors, and sweetness of the blueberry make it an ideal fruit to make wine from. I've experimented with a number of blueberry wines, and hope that you will enjoy them as much as I do. If you don't see a recipe that you like, keep checking back. I will add more on a regular basis. This blueberry wine recipe is super easy, and makes a very tasty wine. Not only is it a delicious, but exceptionally inexpensive one to make. All ingredients included, the cost was approximately $1.60 USD per bottle. One package of wine making yeast. I used Lalvin 71-B for this wine. Boil about one quart of water, and then thoroughly dissolve the sugar in it. Make sure that the sugar completely dissolved. Remove the water/sugar mixture from heat, and add the frozen concentrate. If you leave the concentrate out for an hour or so before hand, this step is much easier. Make sure it's good and mixed. Pour the water/sugar/concentrate into your primary fermenter, and then add additional water until you've got a gallon. What I like to do is to fill a one gallon carboy with water, and then pour it into the primary fermenter. Using a permanent marker, I will then mark the one gallon mark on the outside of the fermentor. This makes the measuring up to one gallon really easy. Add the remaining ingredients except for the yeast. Stir it well. Using your hydrometer, take a specific gravity reading. It should be in the 1.080-1.090 range. Activate your yeast, and add to the juice. Recover. When the specific gravity gets down to 1.00 (usually about 5 days), add a crushed camden tablet, rack to your secondary, and top up. Attach an airlock. Wait 30 days and then rack again. Make sure to top up if necessary. After an additional 30 days, stabilize and sweeten if you like. Then rack into bottles. Allow to age in the bottle for at least 30 days, then share with your friends and family.